Planet Salem: the international Salem Al Fakir fansite! : The end or the beginning? Just as a follow-up to last night's post, I thought I would just mention a couple of things which I haven't had time to write about. 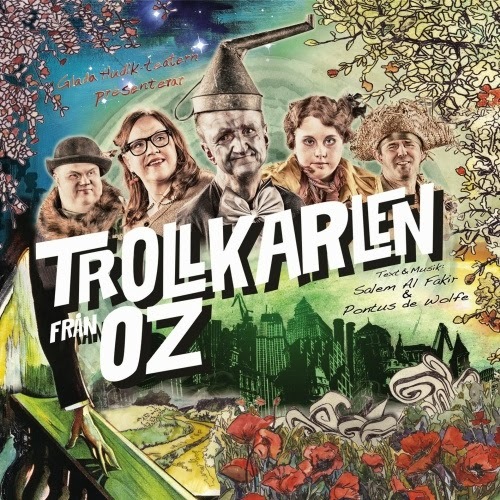 Firstly, the soundtrack album of "Trollkarlen Från Oz", the musical written by Salem and Pontus de Wolfe for the Glada Hudik theatre, was released last month. The album features an all-star cast of well-known Swedish musical talents from past and present, including Tommy Körberg, Sarah Dawn Finer, Lisa Nilsson, Ulrik Munther and Eva Dahlgren. Salem and Pontus appear on a couple of tracks, "Ouvertyr" and "Jag Vill Gå Bredvid Dig" both of which have a retro, early 70's feel. The musical is the subject of a new TV4 documentary series, "Trollkarlen Från Glada Hudik" and if you live in Sweden you can watch it at http://www.tv4.se/trollkarlen-fr%C3%A5n-glada-hudik however those of us living outside Sweden can't watch it due to TV4's "not available in your region" rules. Could Salem be ready to relaunch his solo career, perhaps with a new album and a new record company? Could this mean a brand new official website is on the way? Of course I would love this to be true, but I am beginning to wonder if Salem may be moving on to another phase of his career? In which case, I know we would all be disappointed if he was to give up his career as a recording artist, however I also know that we would completely respect and support any decision he makes. So what's happening? We need answers! !